Seriously. I LOVE to find the perfect gift for the people in my life. I love to surprise them and see the look on their face when I get it right. But there is a little something else I love to do: give back. I have a fairly robust list of people I gift – between family, my tribe of friends, colleagues and people I like to surprise spoil. That means I’m constantly on ‘gift alert’…..what would they LOVE? But I also ask myself another question, “Is it possible to spoil the people I adore (or surprise them) AND make the world a little better at the same time. Because this matters to me, I’ve curated some of my FAVORITE places you can buy for the people you love AND give back at the same time. 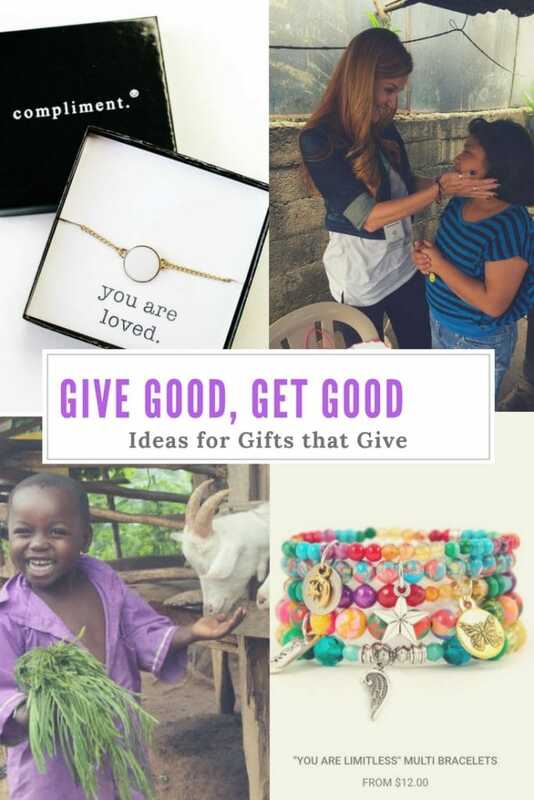 You’ll find jewelry, t-shirts, accessories and a slew of options your family can commit to – from easing the burden of a family with a sick child, to sponsoring a child in another country to helping to feed little ones right here in the United States to supporting the efforts of a family in a third world country to pull themselves from poverty. Brave New World Designs– Have I told you that I have brilliant, kind, compassionate friends who are working DAILY for a better world? My friend Christine Koh is one of them. This past year she started Brave New World Designs. I will allow her beautiful words to describe her mission, “Brave New World Designs is on a mission to make the world a little better each day by giving voice to the virtues of creativity, humor, wisdom and love. Our work is part poetry, part adventure, part advocacy and part silly.” I have three of her t-shirt designs in my closet and my small girl has a favorite as well. 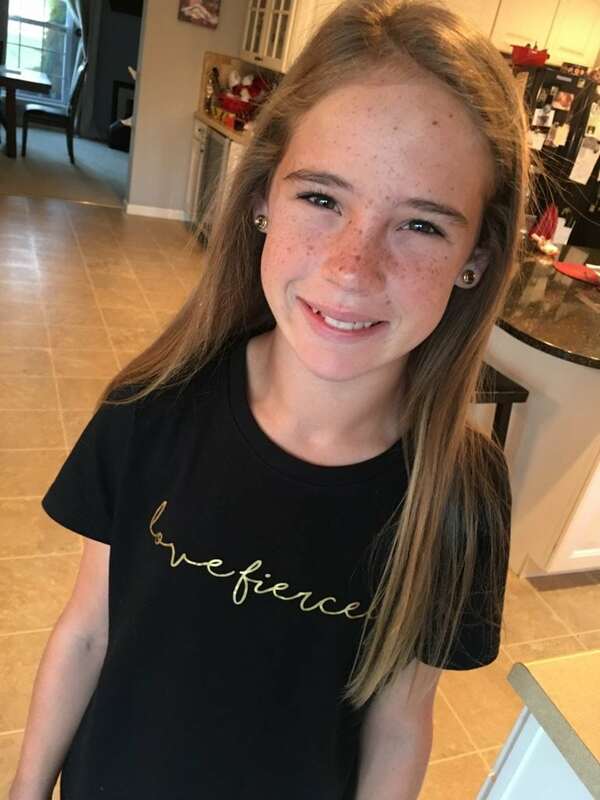 She wore her ‘Love Fiercely’ shirt to school for picture day and it is PERFECT. Shop Compliment – I have a personal policy of complimenting ANYONE I find deserving. Have a kind heart, beautiful eyes, lovely manners? I will tell you. My friend Melissa has built a beautiful business with the same mission. She and I actually found each other here online and I’ve been addicted to her heart and commitment to offering education for girls ever since. 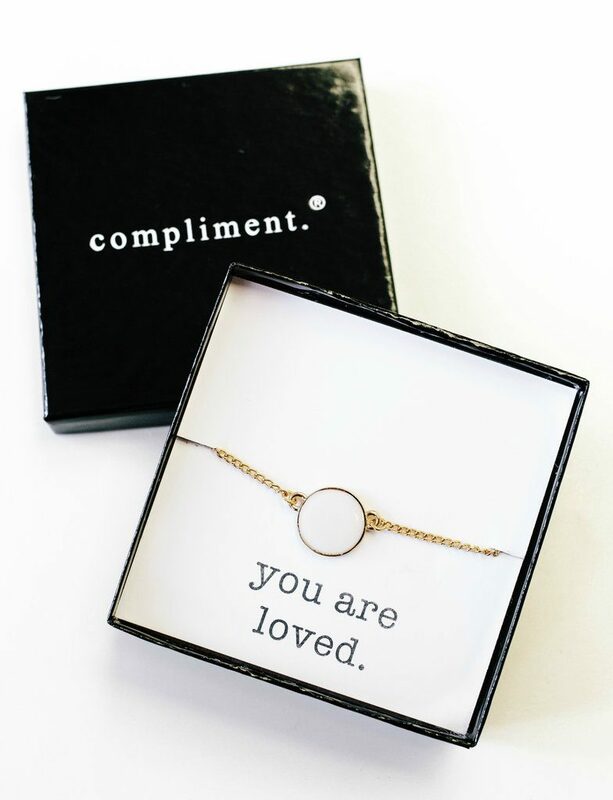 5% of each purchase from ShopCompliment goes to a scholarship fund for girls. It is magic. And so are Melissa’s products. She started with jewelry – and each piece comes with a personal ‘compliment’…but she has expanded to inspirational coffee mugs, candles, notebooks and so much more. 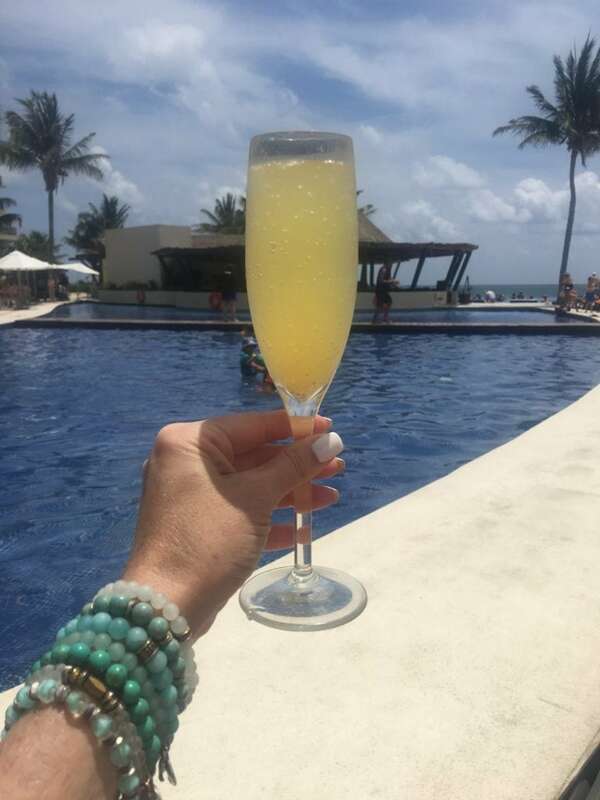 Pura Vida – Have a cause that matters to you? I’m fairly confident Pura Vida has you covered in their charity bracelet collection. You can support animal awareness, education, mental health, cancer, diabetes, the military, Parkinson’s disease and SO MUCH MORE. Each and every bracelet is handcrafted by artisans from all over the world. The bracelets are worn by millions of people around the world (I have a few dozen!) and provide full time jobs to more than 150 artisans around the globe. They are partnered with more than 190 charities around the world and have donated more than $1.5 Million dollars. And they have more than just bracelets. They are a go-to for gifts for me. Ohhh – and they have a subscription service!! Chavez for Charity – I have told you I know extraordinary people, yes? Julie Marie Chavez is a fellow University of San Diego Alumni and someone I knew in my time at the University. She graduated and created the magic that is Chavez for Charity. As with Pura Vida, you can support some of the causes and organizations that mean the world to you. From the Matthew Shepard Foundation to the Malala Fund and Erin Brockovich Foundation (and so many more) – the purchase of each and every bracelet means you are making a difference. And the options are gorgeous. I regularly give them as gifts. I am Just One. – If you have ever thought, ‘but I am JUST ONE PERSON…how can I better the world?” – you aren’t alone. I AM JUST ONE is built on the premise that yes, yes! you can make a difference. Just One has the beautiful goals of offering hope, raising awareness and creating advocates. They are offering fair trade jewelry that subscribes to the notion of a ‘hand up’ not a ‘hand out’ so that you know, with each and every gorgeous purchase you are helping to allow a beautifully talented artisan to support themselves and maintain their dignity. Cause Box – You know I LOVE subscription boxes. This is one that offers not only a series of gifts for the receiver, but each and every item in the box has a story and makes the world a better place. The boxes are curated for women and each item you receive is either in partnership with CauseBox or comes as a limited edition product from a socially conscious company. Boxes arrive quarterly and subscriptions are about $50/quarter if you pay annually. I LOVE MINE. The products may be jewelry, art work, fashion, apparel, accessories or beauty products. There also have a limited edition box for men for the holidays. The benefit of giving the intangible – you are blessing someone you love (and possibly that ‘person who has everything’) with the gift of having helped someone in need by your gift in their honor. No Kid Hungry – I have long been committed to ending child hunger. It shouldn’t even be A THING. And yet, it is. ONE in SIX children in the United States don’t get the food they need. That makes learning, living, just being a kid nearly impossible. Share Our Strength is an organization working to make sure all kiddos get the food they need where they live, where they learn and where they play. I’m happy to join friends like Tim McDonald who have been advocates for this cause for years. Additionally, through its Cooking Matters program, the No Kid Hungry campaign educates and empowers low-income families to stretch their food budgets so their kids get healthy meals at home. 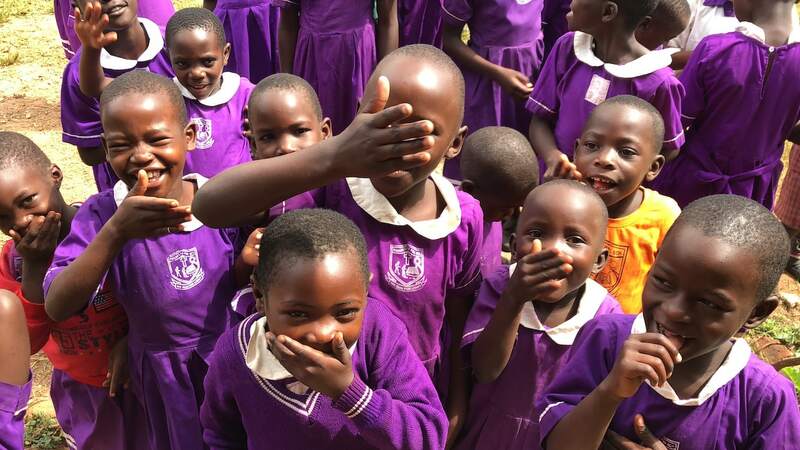 World Vision – My life is richer for the time I spent in Uganda with World Vision this year – bearing witness to the incredible work they are doing each and every day, in countries around the world. With a primary mission to help communities to lift themselves out of poverty (for the last 65 years) and make sure the children are granted the gift of experiencing childhood – they have a commitment to the promotion of justice, community development, public awareness, partnering with churches and creating public awareness. I was gifted the opportunity to meet both of the incredible boys we sponsor – Samanya and Aolyisus. 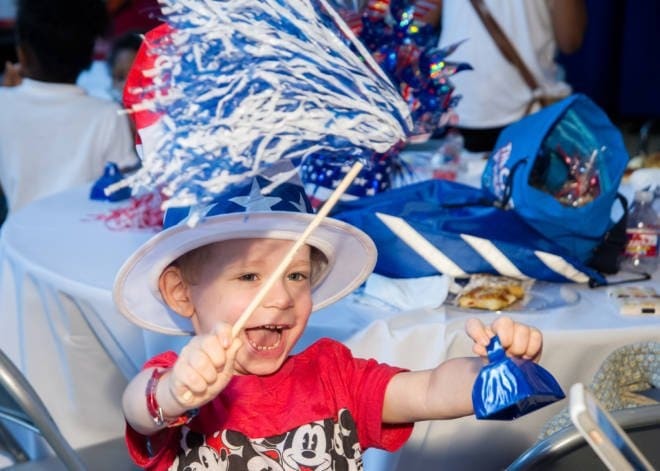 You can certainly add a child to your extended family this holiday season, but there are so many other ways to give as well – from straight donations to a gift catalog of gifts given in a loved one’s honor. Popular choices include everything from medicine, to goats and chickens to soccer balls for play. Some are as little as $25, while others – benefitting an entire community, like a well for water, run $150. Unbound – This is a gift you can do as a family – sponsoring a child in need in another country. A portion of Unbound’s mission is to ‘see potential, not poverty’. 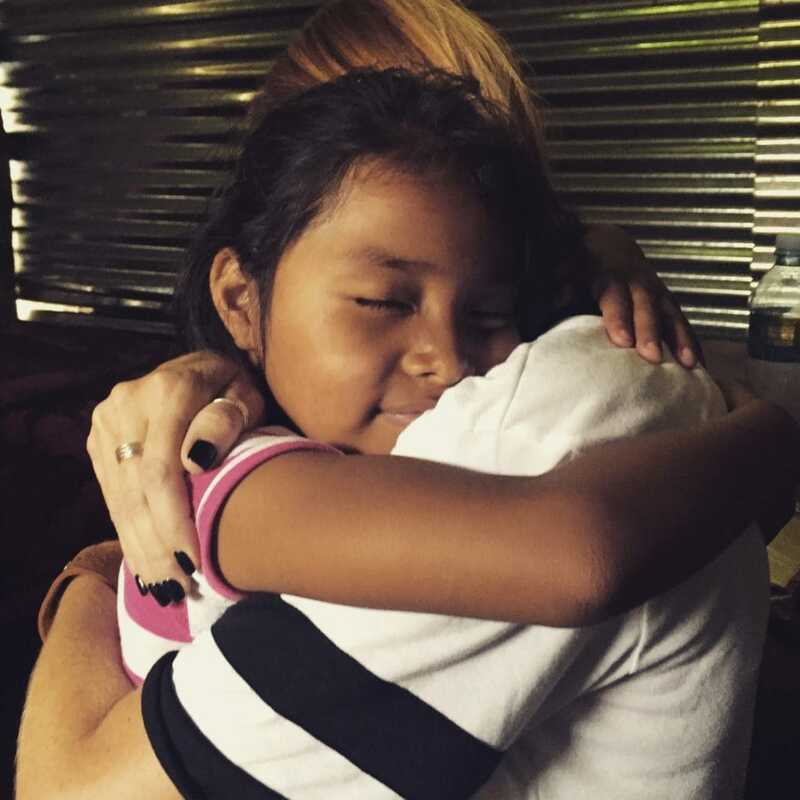 By sponsoring a child as we have (Karen and Jacqueline both live in Guatemala), my small people are learning not only about another culture as they can communicate with both girls, but also what is means to truly give to someone else. In order to qualify for sponsorship, Jacqueline and Karen, (like all other children) must be enrolled in school. Dropping out at any time prevents them from being sponsored. Now that my family has committed to both of them, the folks at Unbound sit down with the family and determine how the sponsorship could most benefit them – food, clothing, school supplies and items that can help them break the cycle of poverty – like pigs, chickens, seeds for farming and trees for growing fruit – are all options. The $60 ($30 each) we spend each month to sponsor these two girls clearly provides much needed financial assistance for their families, but it is equally beneficial for us: My children are seeing good works and love in action, they are learning about another culture, and they have a connection to another child who is opening their eyes to an entirely different way of life. 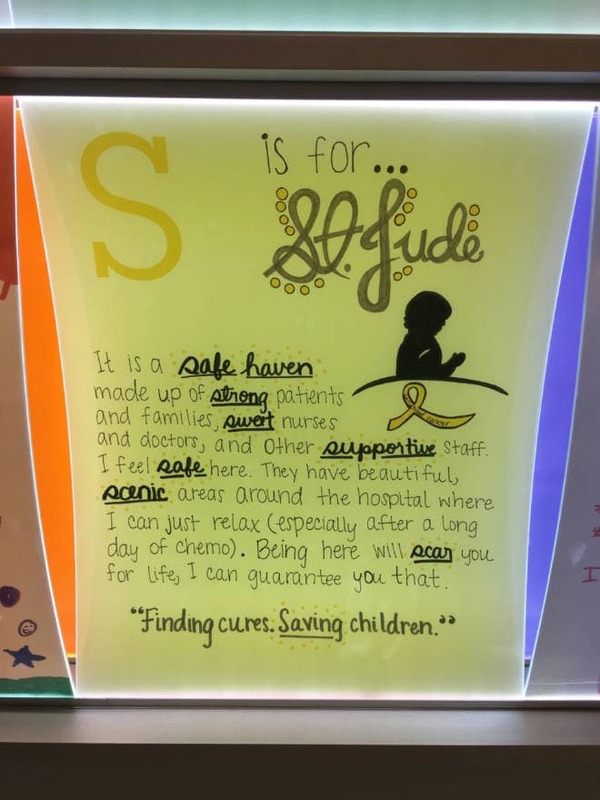 St. Jude – You are likely not a stranger to St. Jude’s Research Hospital in Memphis. I bet you know it is committed to saving the lives of children living with rare forms of cancer. But did you know the doctors, nurses, and staff treat each child and each parent like family? The atmosphere is warm and inviting, it does not smell like a hospital (despite being a thoroughly sterile environment), the walls are painted with kids in mind and decorated with heartfelt art work created by the kids living there. Though there are only 78 beds on campus, there are three different housing options available based on how long a child will need treatment – from a week to a handful of years. 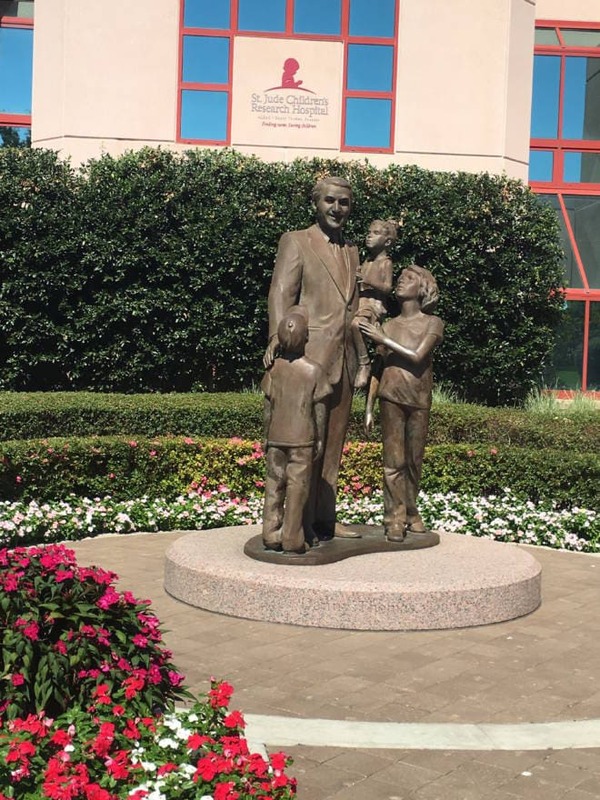 No matter how long a child receives treatment, no matter how long their family must live in St. Jude’s housing, no matter how far they must travel for the life-giving, life-saving treatment they need, they will never receive a bill – not for medical care, not for housing, not for food and not for travel. It costs $2.2 MILLION dollars A DAY to keep this miracle in Memphis open and saving lives…and it all comes from donations. (That’s SIXTY-SIX million dollars a month for those of you doing the math). Here’s another fact that just might blow your mind – 75% of the money that comes in is from individual donors and the average gift is a beautiful and heartfelt $35. Think about this fact the next time you head out to dinner, or pay your monthly gym membership. 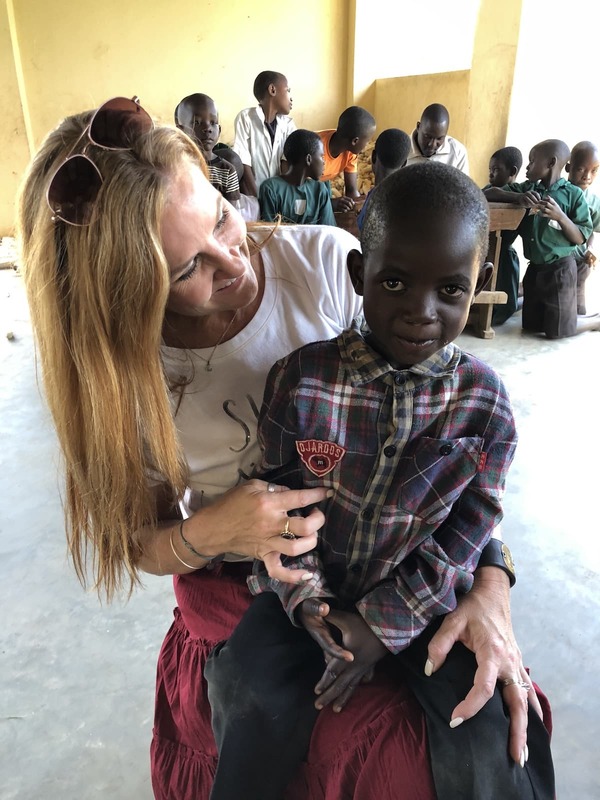 Power of 5 – Two years ago, I visited Zambia, Africa as part of the Power of 5 Program and that experience has never left my soul. There is so much I take for granted. My small people have enough food to fill their bellies every day. They have electricity and education. I sat with mothers who worry daily their children may not make it to the age of five. They worry….are their children getting the nutrients they need to grow and thrive? 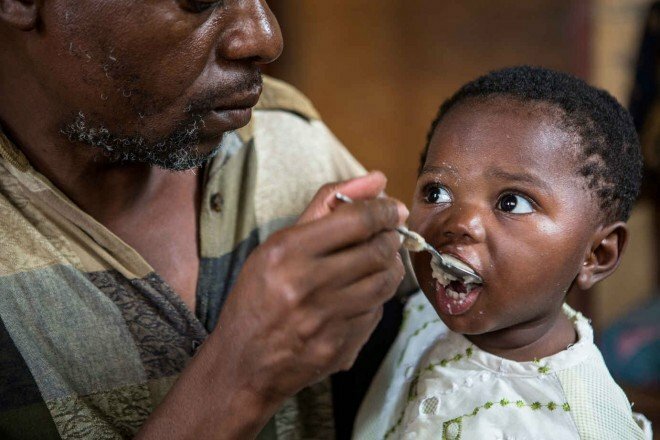 This micronutrient is mixed with a child’s food once a day in order to provide the nutrition they need. Every 30 days, the families I met, along with 200+ other families trek to one of five distribution centers in Lusaka, Zambia to listen to an educational talk, see their children weighed and measured for tracking and pick up their monthly nutrition, their Little Bits, for their little ones. 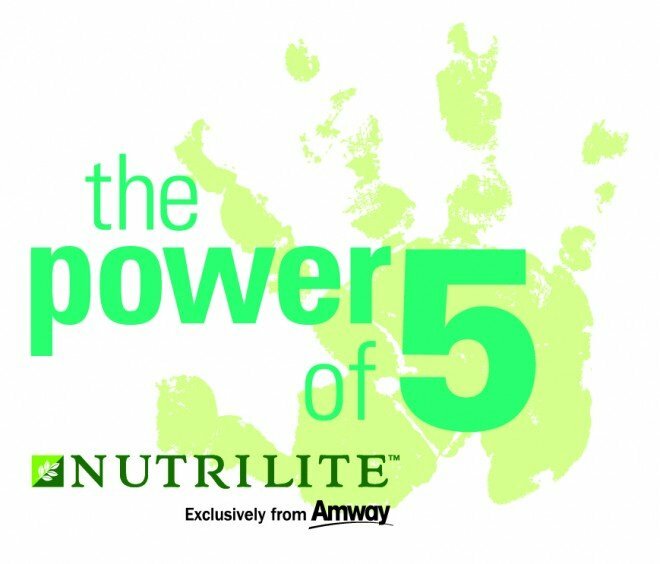 Amway is doing this work in nearly a dozen countries – with a commitment to continue expanding. 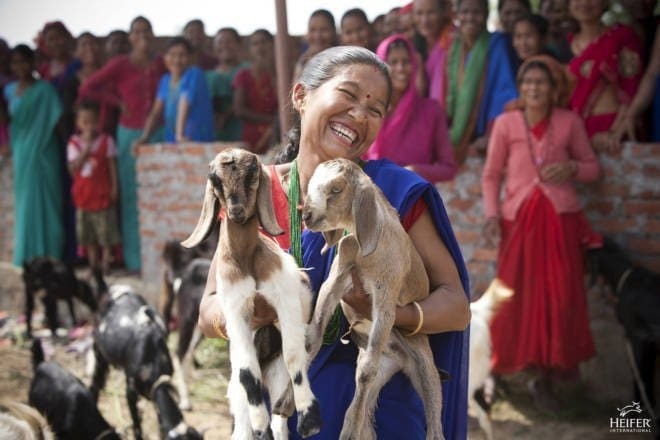 Heifer International – This is a beautiful way to gift a tangible item that is life-changing for a family in need. For 70 years now, they have been working to combat poverty in some of the areas that need it the most (125 countries around the world) – but not simply by – if you will allow the adage – giving men and women fish, but actually teaching them how to fish. Their goal has long been to provide farmers with the opportunity to learn skills and change their circumstances rather than strictly benefitting from gifts from others. 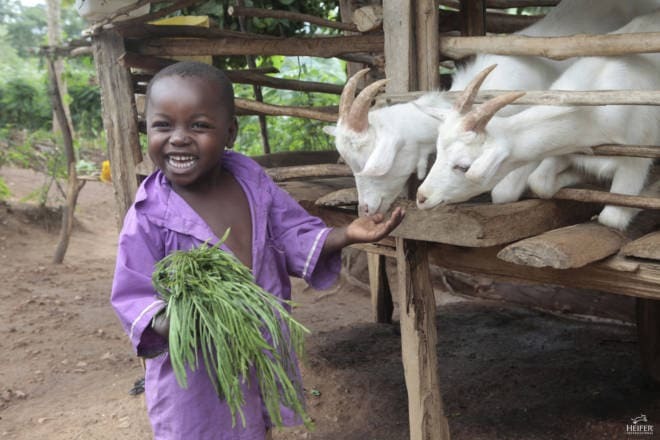 A goat can be purchased for $120 and once given to a family, not only will it be a source of food for them – milk, cheese and yogurt, but these products can be packaged and sold at market, helping the family to earn an income they so desperately need. Other animal gift options include a heifer (naturally) for $500, an alpaca for $150, a pig for $120, rabbits for $60, honeybees for $30, a flock of chicks for $20 and so many more. If the amount you would like to give is less, you can also gift a portion of any of these animals. They also support women’s empowerment and there are ways you can give specifically to this category. Check out their gift catalog. How do you give back this time of year? I would love to hear any additional ideas you would add to this list. Happy Holidays! And happy giving. I love these! In this day and age, I think it’s key to shop from places that do their part to give back to the world that we live in. 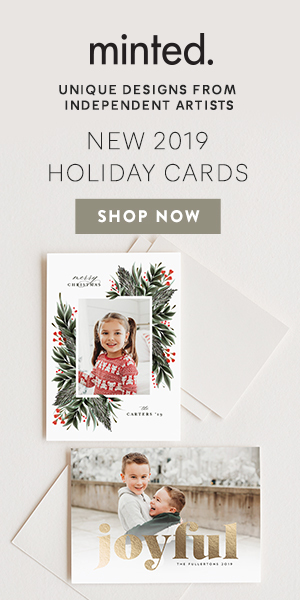 I really love that you focused this entire gift guide with gifts that when purchased, the company gives back to where it’s needed the most. What a great way to give to a bigger cause. Thank you so much, Joanna – I do my best to do as much shopping as possible with companies like this. I love the idea of shops giving back. There’s so many ways that we can help others in our shopping. It’s ridiculous that more companies don’t do it. I will definitely shop a few of these. I still have some presents to get so I am going to have to sit and go through these as I absolutely love the idea of being able to gift and give at the same time. Perfect! We like shopping at places that give back. This gift guide is awesome for that! I am totally with you on this! I try to do most if not all my shopping from places that also give back! Thanks for this great list as I have literally fund a bunch of new places to shop here! Any type of gifts that give back are the best in my books. Love the look of those bracelets: very tasteful! It is nice to shop to the places which are also there to give back. I know that the money is going right so well. And that is really awesome! All are worth it. There is nothing better than making sure that you also give back during the Holidays! These gift ideas are brilliant and it’s nice that you’re also able to help those in need. I Loe this list of gifts that give back! I need to check out a few of these because I saw a few things that would be perfect for my friends! My daughter would love a shirt like that! It’s amazing that you can get a gift then they will give back, that’s awesome! I love these ideas! I was just thinking about this the other day, whether you buy gifts that give back, or at least you support local, or support small artisans around the world. 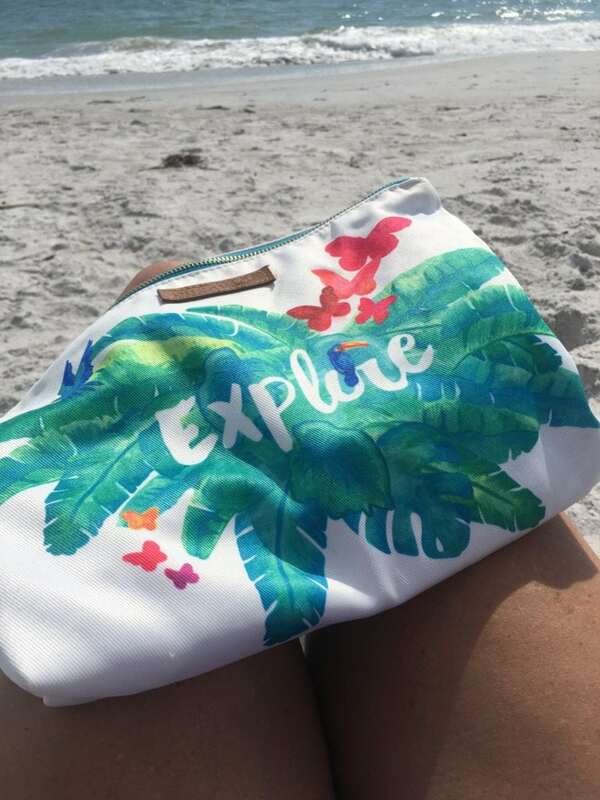 These would make awesome gifts – I have to have that Explore clutch! What a beautiful piece. I would love to have one of these myself. I think these are going to make such great gifts. I know a few people who would love this. This is a wonderful way to give and to get the Christmas. And beautiful jewelry also. I love the simplicity and power behind each piece! This is great! I love giving too, but always second guess my gifts. Definitely getting those gorgeous bracelets. I love the t-shirts and think that my niece would enjoy one of them. I love shopping for gifts and finding things that help others too. These products are great! I think it is so important to support businesses that give back! Gift giving is my love language too! This is such a great way to give while still contributing to some great causes. I absolutely love supporting causes like this. It’s a plus that you get an item to give as a gift in return! I love to purchase gifts that give back! It makes me happy to help someone else while sharing a gift. This is a great list and I am pinning it for future gift giving! That is so kind and thoughtful of these companies to give back. Love all these gift ideas you featured here. Like you, I love giving gifts as well. I’ve only heard good things about St. Judes but never knew where it actually was located at. Appreciated learning more about the place through your post. It really is a remarkable institution! I really love these ideas and that these shops give back. I want that Love Fierce shirt!